Published by the American Geophysical Union as part of the Water Resources Monograph Series, Volume 18. Landslides are a constant in shaping our landscape. Whether by large episodic, or smaller chronic, mass movements, our mountains, hills, valleys, rivers, and streams bear evidence of change from landslides. Combined with anthropogenic factors, especially the development and settlement of unstable terrain, landslides (as natural processes) have become natural disasters. This book charts our understanding of landslide processes, prediction methods, and related land use issues. How and where do landslides initiate? What are the human and economic consequences? What hazard assessment and prediction methods are available, and how well do they work? How does land use, from timber harvesting and road building to urban and industrial development, affect landslide distribution in time and space? And what is the effect of land use and climate change on landslides? Those who study landslides, and those who deal with landslides, from onset to after-effects—including researchers, engineers, land managers, educators, students, and policy makers—will find this work a benchmark reference, now and for years to come. 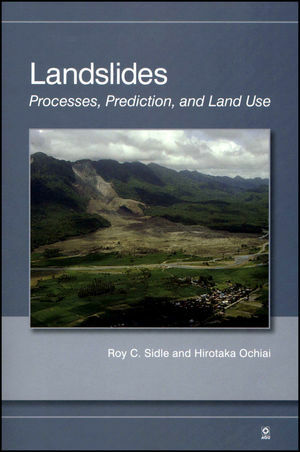 Roy C. Sidle is the author of Landslides: Processes, Prediction, and Land Use, published by Wiley. Hirotaka Ochiai is the author of Landslides: Processes, Prediction, and Land Use, published by Wiley.